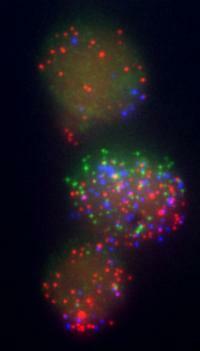 In this image of mouse embryonic fibroblasts undergoing reprogramming, each colored dot represents messenger RNA associated with a specific gene that is active in cells being reprogrammed. Red dots represent... Several years ago, biologists discovered that regular body cells can be reprogrammed into pluripotent stem cells — cells with the ability to become any other type of cell. Such cells hold great promise for treating many human diseases. Once the reprogramming, which took between 32 and 94 days, was complete , the researchers looked for genes expressed only in the cells that ended up becoming pluripotent. The researchers also found that several previously proposed markers for pluripotency were active in cells that became only partially programmed, suggesting those markers would not be useful. With their newly discovered markers, "you can eliminate all the colonies that are not completely reprogrammed," Buganim says. "You don't want to use partially reprogrammed iPSCs for patient-specific therapies." During the early, random stage, there are probably many ways that Sox2 can be activated, Buganim says. "Different cells will activate Sox2 in different ways," he says. "As soon as you have a specific combination that allows the activation of Sox2, you are on the way toward full reprogramming." Page took 0.016808 seconds to load.